Valentine and Christmas Candy or any candy is now my favorite, however this was one recipe which begs to be tried. 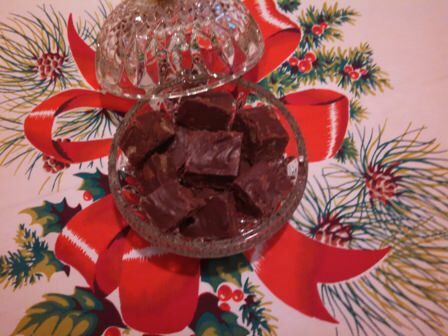 Skillet Chocolate Fudge is an old recipe found in a box of recipes stored and forgotten. It is easy and quick; it does not use a candy thermometer to know when it is ready. Using the electric skillet at 280 F does it for you. Please note due to technical problems, use only 1 line of ingredients when you see duplication of same ingredient. A quick and easy chocolate fudge recipe made in a skillet. Prepare a 9 x 9 inch pan lined with aluminum foil and/or well buttered. Combine the first 4 ingredients into an electric skillet. Set the temperature at 280 F.
Stirring to blend, bring the ingredients to a boil. Boil for 5 minutes while stirring constantly. Add the marshmallows, chocolate chips and vanilla. Stir until the marshmallows and chocolate chips are melted and blended smoothly. Pour the candy into the prepared pan. If poured into pan lined with aluminum foil,, lift out and cut into squares. you great recipes for your cooking experience. ©2007-2019 Netta Belle’s Choice® The Art of Gourmet Cookery® cookbookinabox® “Reg. U.S. Pat. & Trdmk. Off.” Reg. “Trade-marks Canadian Intellectual Property Office. “Netta Belle’s Choice® The Art of Gourmet Cookery® cookbookinabox® All rights reserved. 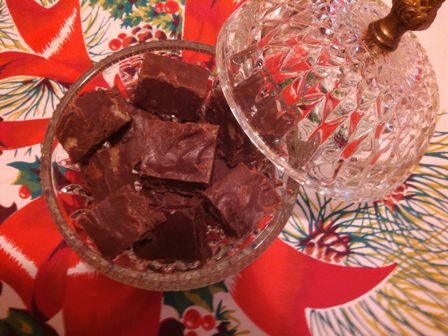 There are so many fudge recipes available on the internet, cookbooks, newspapers and magazines. I am certainly this has been viewed and used many times. My original recipe was published in a small booklet put up by the Indiana Public Service in 1977. What is so special about this, I made it and it fudged! I hope you try it and enjoy. Happy Holidays to you from cookbookinabox! Julia Ann and cookbookinabox® in partnership with Netta Belle’s Choice® brings you great recipes for your cooking experience. ©2007-2019 Netta Belle’s Choice® The Art of Gourmet Cookery® cookbookinabox® “Reg. U.S. Pat. & Trdmk. Off.” Reg. “Trade-marks Canadian Intellectual Property Office. “Netta Belle’s Choice® The Art of Gourmet Cookery® cookbookinabox® All rights reserved. 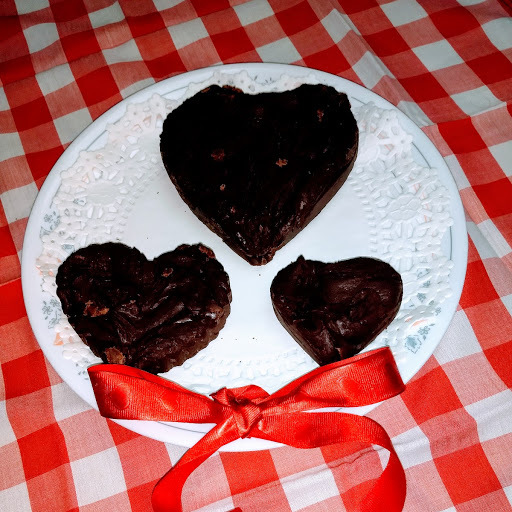 This entry was posted in Candy and tagged candy, chocolate, chocolate chips, fudge, skillet on January 21, 2019 by Julia Ann.